NAMIBIAN musicians gathered to create a sense of togetherness and national pride, and launched the “Beat of Namibia” song last week. The hyped up song, which is part of the “Beat of Namibia” campaign, was launched six weeks ago, inviting Namibians from all walks of life to be part of creating a song for Namibia. Namibians were asked to send in video clips of 15 seconds long showcasing their own, unique beats, tunes and dance moves for a chance to be featured in the biggest song ever made in the country. 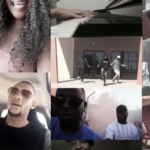 From playing drums on empty paint cans, to the sound of traditional ululating and sharing of secret dance moves, thousands of entries, which created a cultural melting pot, were received via WhatsApp for the “Beat of Namibia” campaign. And so, the “Beat” was born! Namibia’s most renowned music producer, Sam-E Lee headed the production with the support of Namibian Artists Sunny Boy, Treza, Adora, Berthold, TheFuturelsGiggz, KP Illest, Top Cheri, and Ghetto Ballerina. Every entry was curated by the team and used to build the song – a beautiful chemistry of co-creation that encapsulated the Beat of Namibia. This proudly Namibian creation will also be heard in every corner of the country on national radio stations, NBC television and DStv, and will also be live on online music platforms like YouTube.